There are many effects in the arsenal of Bruce Springsteen and the E Street Band, all of which they can call up at will. Longtime fans know that feeling of becoming addicted all over again. For newcomers, instant fandom is nothing short of a force of nature, and tonight at Magnetic Hill in Moncton, that force was brought front and center. Opening the set to a swell of applause, Bruce called out, "Are you ready for the function in Moncton?" On display during the opening series of songs was the range and power of the E Street Horns and the E Street Singers, helping "Working on the Highway" and "Wrecking Ball" to fill the open air venue. Bruce made no secret about being blown away by this audience right from the top, calling out, "You're pretty lively here in Moncton." After a rumbling "Death to My Hometown," Bruce confessed to the crowd, "I'm fascinated by Magnetic Hill." Likening the Hill affectionately to his old lovers lane Gravity Hill, he told the audience that both were places where, "you park your car at the bottom and it slooowly creeps its way to the top... Here's to gravity." Then, never having played Moncton before, Bruce asked who had never seen him perform. From the stage, it sounded like about 80 per cent of the audience had never been to a Bruce show. "Well, I see we have our work cut out for us." From that moment on, Bruce and E Street were dead set on making fans out of everybody there. Moments later, the stage erupted into "Spirit in the Night" followed by a by-request "Pay Me My Money Down," (via an impressive foam dollar sign with battery powered Christmas lights) a first for the Wrecking Ball Tour. The Seeger Sessions favorite featured not one but two Charlie Giordano accordion solos and the E Street Horns coming forward to burst pipes. A sign reading "I Love Soozie and Darlington County" brought a spirited shout from Bruce, and the song itself, and of course, some incredible violin soloing from Soozie. "The Rising" saw Nils give us steel guitar the way it was meant to be, and Max played drums like a warrior on "Glory Days." 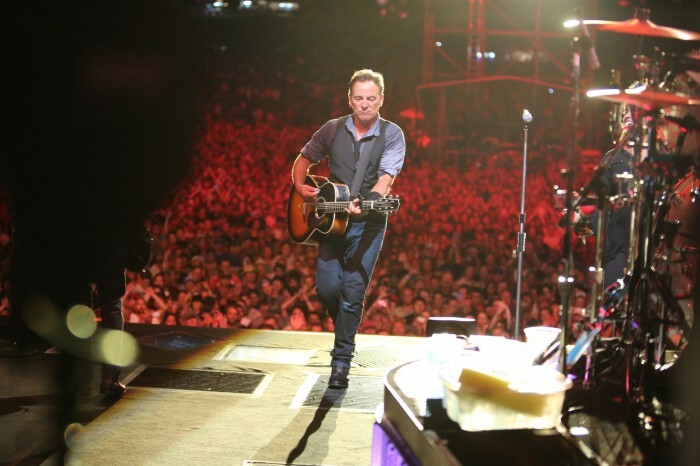 "Dancing in the Dark" and "Tenth Avenue Freeze Out" saw Bruce overwhelmed by the crowd, but not ready to leave. With a cry of "One more for Moncton!" Bruce brought up opening artists The Trews and Tom Cochrane for a devastating "Twist and Shout." As the show ended, Bruce exclaimed "Moncton! We're coming back! Unbelievable!" After the show, he told a reporter that the Moncton crowd was a "Sweet, sweet audience... many of who had never seen the E Street Band, and you would never know it."